I can tell you are excited about this tutorial! I’ve had more comments and compliments on the side panel on my kitchen desk and on the range hood. They are definitely the details in our kitchen that make it personal. I got the idea after seeing Sarah Richardson’s kitchen, where she actually used reclaimed lumber on the side of her cabinets. But, I knew finding the right distressed wood would be tricky. Plus, I always worry about the presence of lead paint. Instead, I decided to make it and fake it. As promised, I’m sharing the tutorial with you. 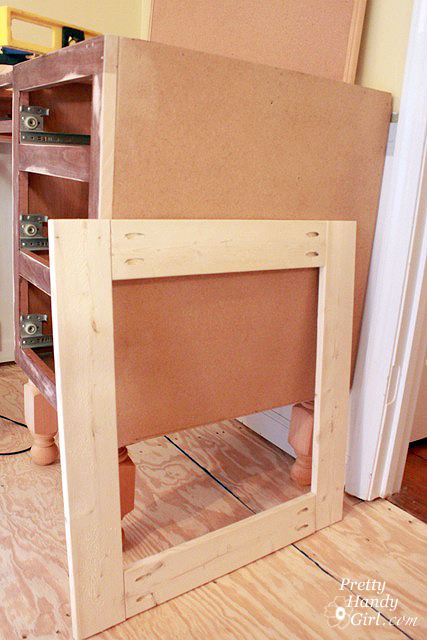 Create a frame for the side of your desk (or cabinet) using 1×4″ boards and a Kreg Jig. You can follow this tutorial for making open frames with a Kreg Jig. Attach the frame to the side of the desk using Gorilla Glue and finish nails. Countersink the nails with the nail set. Fill nail holes and seams with wood putty. Let putty dry and sand smooth. Prime and paint the frame to match the rest of the desk. Cut the plywood pieces with a jigsaw and sand the edges smooth. Lay boards onto a drop cloth and paint them different colors. I used a very watered down paint to allow the wood grain to show through. Add a white wash on top by using watered down white paint or dry brushing. 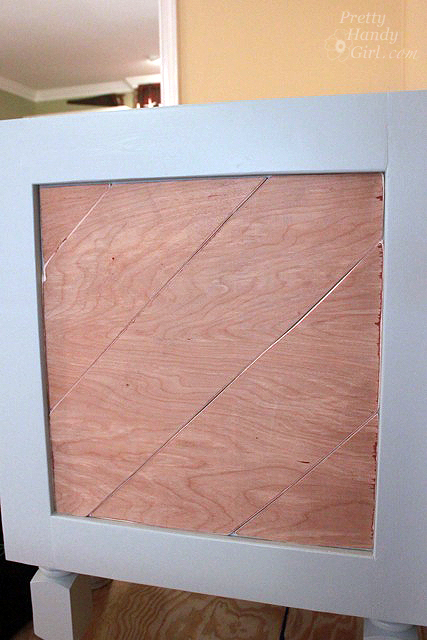 Once you are happy with the distressed boards, get ready to glue them into the frame. Add Gorilla Glue to the back of the boards. Set them into the frame, use coins as spacers to hold the panels in place. Once the glue has dried, remove the coins. And…admire! And that my good friends is the way to create distressed boards for the side of a desk, range hood, or wherever you want to add visual interest. Please feel free to pin and share the tutorial with others. I’ll be back later this week with the tutorial for building a custom range hood! P.s. Because I know you’ll ask: The desk color is Copen Blue by Sherwin Williams. And the floor is golden oak and natural nugget cork flooring by Globus Cork. Gorgeous, gorgeous, gorgeous, gorgeous…. oh yes did I tell you how GORGEOUS I think this all is? Love it all! I love it. Hoping to use something like this on the new island. Definitely pinning this! I’ve been drooling over the side of your kitchen desk for awhile! Can you please tell me the paint colors you used for the distressed wood panels? You did an amazing job with painting the wood panels… Simply gorgeous! Thanks for a great tutorial! You have inspired several new projects for this spring!